This Bull Terrier nicknamed Dreamer sold and went to a new family. American. Canadian. 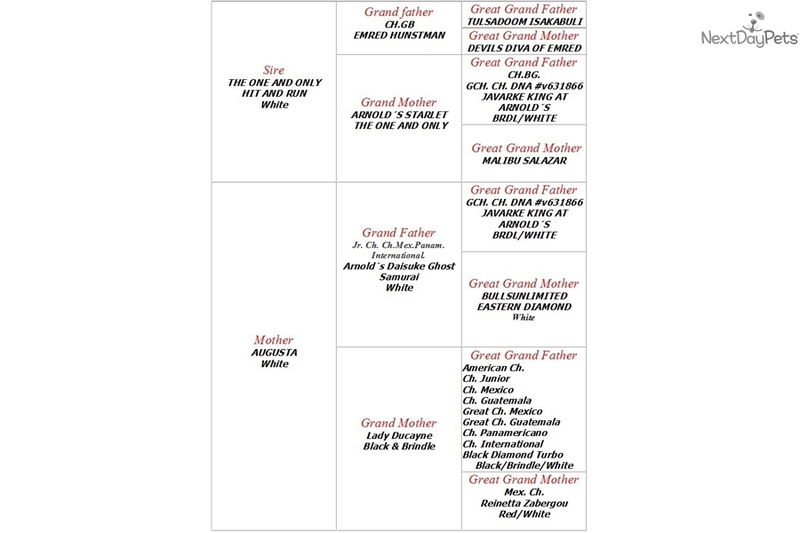 Mexicans and European Champions blood lines. 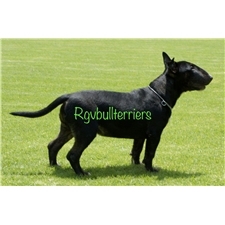 The Bull Terriers, sometimes called "Bullies," are medium to large sized dog with muscular, athletic bodies. One of the Bull Terrier's most memorable physical features is the rounded front of its head. 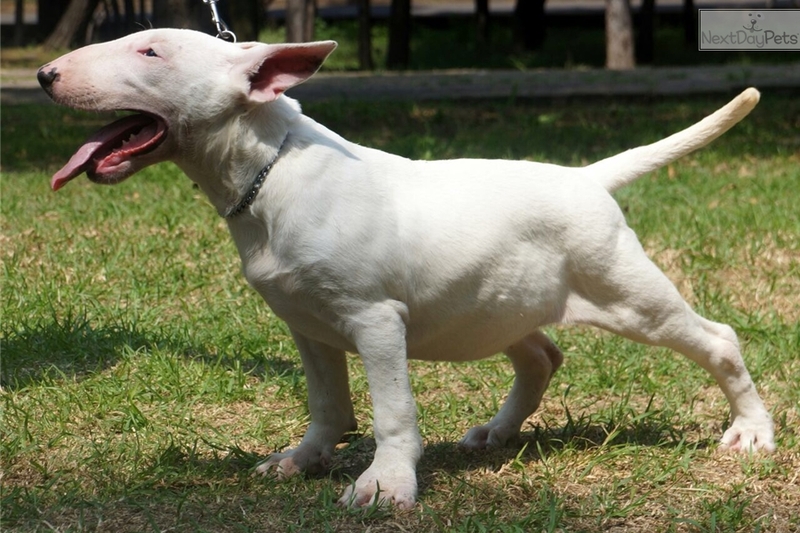 This breed was made especially back in the 1980s when a Bull Terrier named Spuds Mackenzie starred in Budweiser commercials. Some may feel that Bullies are tough-looking, but this breed is actually highly affectionate, playful and even goofy. In fact, the breed is often called a "kid in a dog suit." The extremely short, smooth coat of the Bull Terrier requires very little maintenance. Only basic routine grooming is necessary. This breed tends to shed at a low to moderate rate, though shedding does increase seasonally. Thorough obedience training is absolutely essential in order to manage your Bull Terrier. This dog breed can be stubborn and mischievous, sometimes even destructive. In addition to training, this breed needs a proper outlet for its high level of energy. 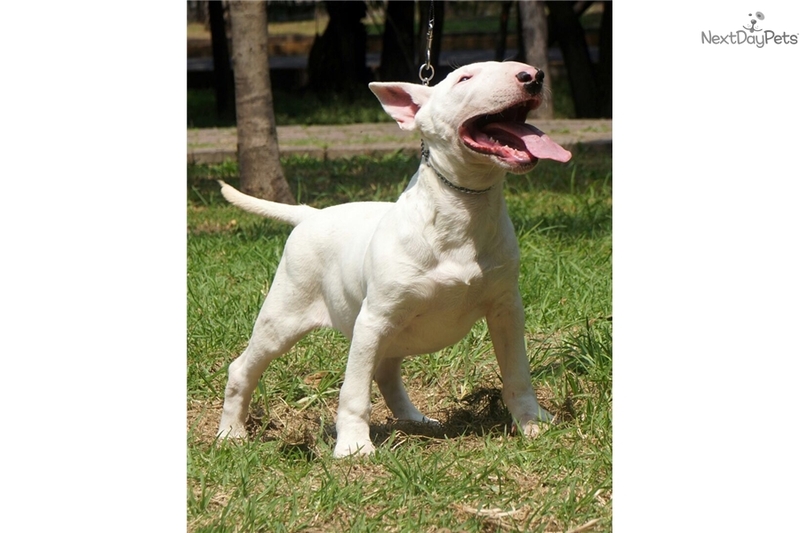 The Bull Terrier is an athletic dog breed with plenty of energy, so routine exercise is very important. Overall, Bull Terriers have friendly, playful dispositions and make lovely companions for many types of households. Bullies tend to get along remarkably well with children when properly trained and socialized. However it may take time for this breed to get along with other pets. If raised together, well-trained and closely supervised, they can learn to get along beautifully. Bullies are very affectionate and tend to bond closely with their owners. If you are active, patient and able to provide plenty of one-on-one affection to your dog, the Bull Terrier could be the dog breed for you family. 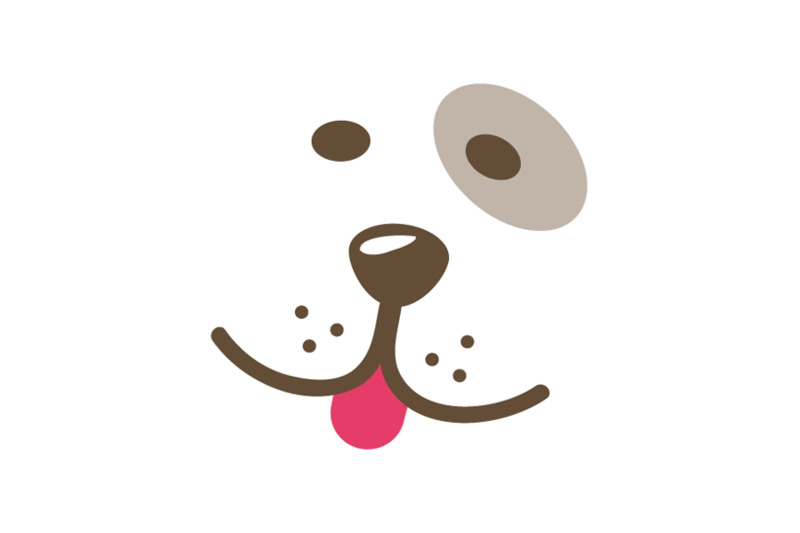 The love for dogs and especially the Bullterrier, makes the person who feels leave behind many material things, ideas, situations and thoughts. Their momentum, their sense of alertness, their constant learning, the desire to play at all times and the need for affection. 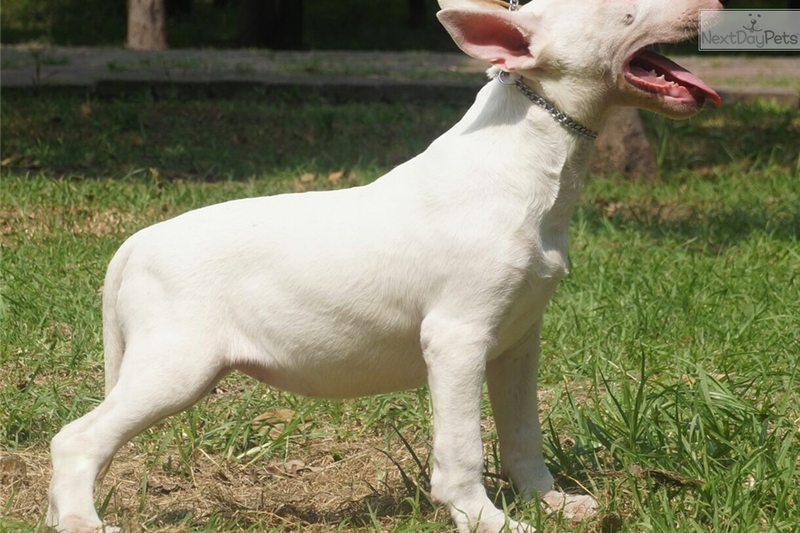 The breed's unequaled head, strength of its jaw, its athletic silhouette made up of muscles and a big heart, make the Bullterrier breed not only an amazing pet, but making it unique in its kind. This is what inspires us to make this breed the icon that it already is. Working day by day to achieve worthy individuals with the physical and emotional characteristics that characterize it. As human beings falls the responsibility to produce dogs worthy of living at home as well as exhibiting in a competition. It is not easy to reach a balance, but every day is worked to make it, an impressive example with an accessible character. The Bullterriers who are born with us have decades of work in the race, presenting examples in tracks to be evaluated and rewarded if this is the case so that we can use them in responsible parenting. We have shown that whether it is the largest of the litter or the smallest, they are fit to cover both aspects, home and track. We always show the complete litter, we do not blind or close the doors to our individuals have a good home. The opportunity has already been given to us with having them in our hands, now we have to give them the opportunity to discover the world and have their own family. We are advised by the work of more than 20 years in canine breeding, we have succeeded in many occasions and in others we have had to lower our heads. The diseases, the ailments, the constant learning has made us strong with the race and why not, with ourselves to be able to offer in a copy the long road that we have already walked. We seek at all times to create Bullterriers that fill the need of those who want a companion, a brother, a son, a family member. Our greatest satisfaction is to see the smile of one who decides to take one of our examples. It does not matter if we have to bring bloodlines of other countries, even from other continents, we do it with the pleasure and joy of knowing that they will be contributions to continue raising responsibly the race that we love so much. If you decide to be part of our project, welcome.